This story begins with a hole in the ground – a nasty, dirty, wet hole, filled with the ends of worms and an oozy smell. 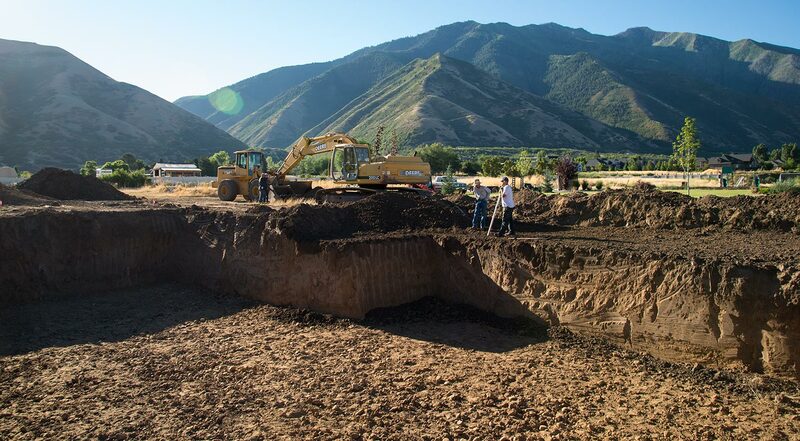 At long last, the excavation for The Thoughtful House in Mapleton, Utah has been completed. The excavation of a house requires skill and careful planning. It begins long before shovel hits dirt with the purchase of a lot. Excavation costs can go up exponentially depending on the type of lot you buy. A very gentle slope, just enough for good drainage. No seismic or flood plain problems that would require special reinforcing of your foundation. No unwanted trees and shrubs that need to be cut down and removed. As few rocks and boulders as possible. If you do have them, ask your builder to set aside those of significant size. This saves you money two ways – you don’t have to pay to remove the rocks from your property and you don’t have to pay for as many rocks when you want to add them to your landscaping. Make sure your builder saves leftover top soil for you so you can use it later for your landscaping. Our architect, Greg Steffensen, and our builder, Kelly Adams of A2Z Construction, were careful to place The Thoughtful House to take advantage of solar siting for energy purposes and of the site’s slight slope to drain water away from the house. Greg also sited the house to take advantage of views of the nearby mountains and to place patios, walkways and other features so that they take advantage of the site’s best features. It’s far better to fit a house to its site than to try to make major changes to the site for the house. Nowhere is this more ture than in designing the site for proper drainage. The first step is to clear the building site. The next step is to set stakes to mark where the house will be situated. Kelly Adams had a surveyor do this to make sure it was exact. The next step is to dig out the area within the stakes as well as about three feet around the outside perimeter to make room to place forms for pouring the foundation. City building codes stipulate how far down the excavation must go to get below the frost line. In our location, Mapleton, Utah, it gets quite cold in the winter, so the frost line is an important issue. Digging out an excavation is an art that requires a good laser level as well as a skilled heavy equipment operator to make sure that a foundation is level. A laser level is a tool with a laser beam projector on a tripod. It projects a beam along a horizontal axis that signals to a staff carried by a worker when the sensor is in line with the beam. This enables the worker and a skilled heavy equipment operator to do the excavation so that it is at the same elevation in all places Our excavator used a crew of four – one heavy equipment operator carefully scraped away the surface with a huge bucket while a worker held the level staff to get the elevation readings on it. A third worker did final levelling by hand with a shovel after the bucket had scraped the soil away down to the right level.A second heavy equipment operator hauled away the soil that had been scraped off of the building site and piled it into huge piles for later use. Watching the two huge machines work in concert was like watching a carefully choreographed dance between two giant monsters.